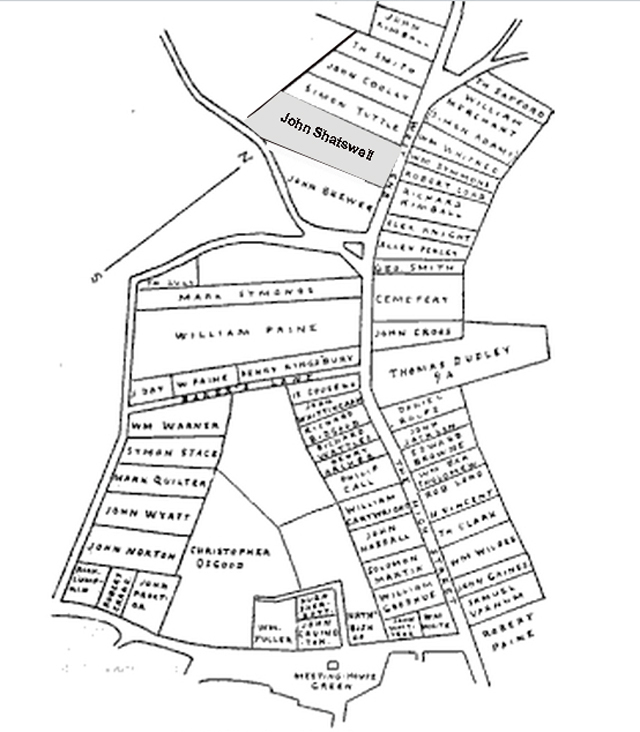 Shatswell was appointed a surveyor of the land upon which other homes were built, and is the earliest person in Ipswich to whom the title of Deacon was given. This House is one of the oldest residences in town and remained for many years in the family by inheritance from the time of the original grant. It was the home of Col. Nathaniel Shatswell, famous for his command of Union troops during the Battle of Harris Farm during the Civil War. Early land grant map, from Ipswich in the Massachusetts Bay Colony by Thomas Franklin Waters. 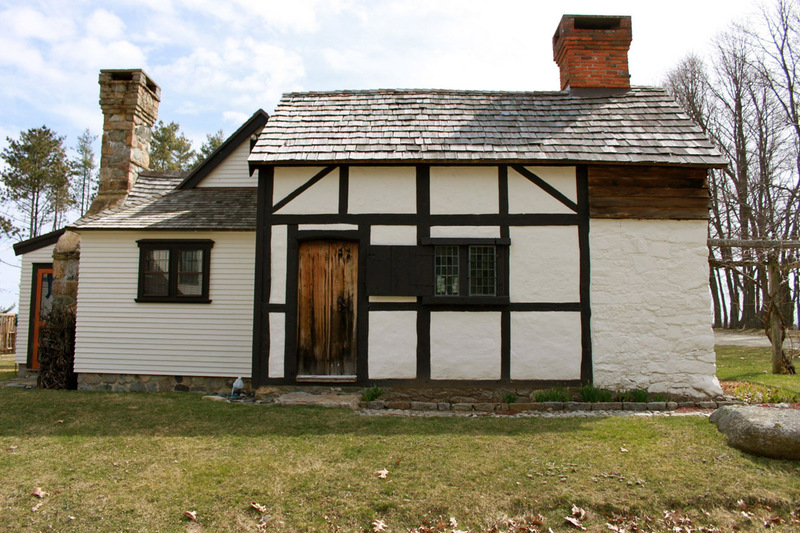 “John Shatswell was one of the earliest grantees, and under date, April 20, 1635, he is mentioned as owning six acres of ground, where his house is built, between Mr. Wade’s house lot east and Mr. Firman’s on the west, Goodman Webster’s lot, northeast. I cannot identify this with the present Shatswell location. This early grant was on the north side of the highway wherever it was, and if another house lot bounded it on the northeast it could not be located on High St. as the lots on the other side of the highway are on the hill side. Early photo of the John Shatswell house. It was at one time owned by three families, who made common use of a single kitchen. 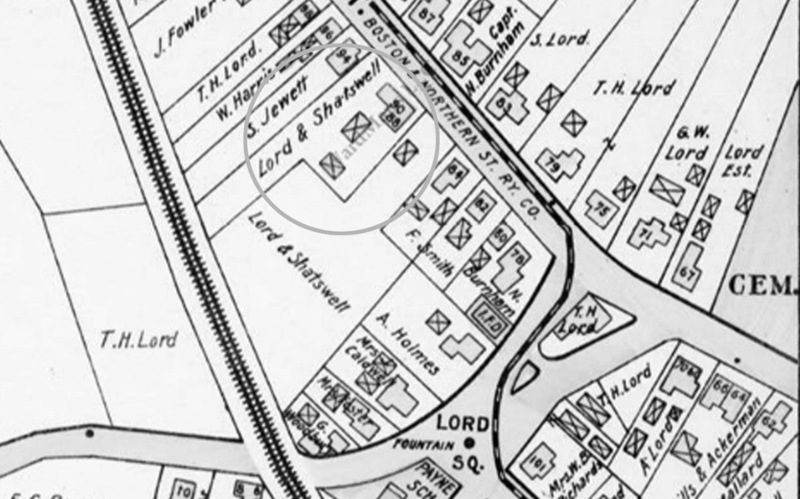 Closeup from the 1910 Ipswich village map shows the Shatswell house at 88-90 High St., with two auxiliary structures behind it and one just to its southeast in the larger lot. That structure was apparently the early Shatswell Planters Cottage, which was moved to Jeffreys Neck Road in 1946. The following is from Alice Keeton in her book “Ipswich Yesterday” . 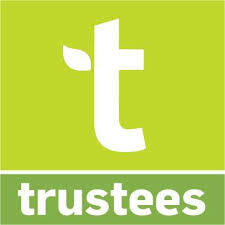 John Shatswell’s son Richard married his next door neighbor Simon Tuttle’s daughter Rebeckah. 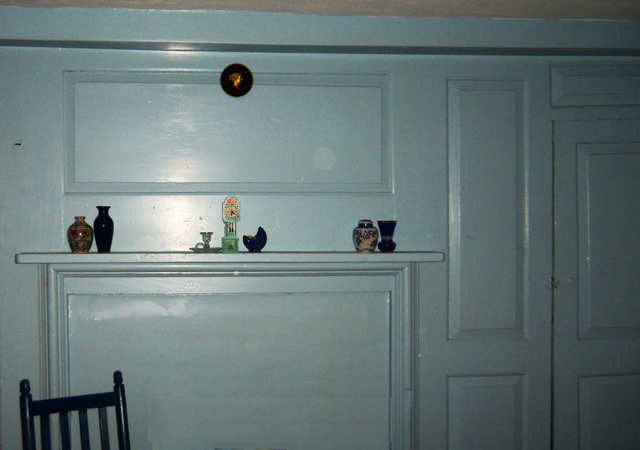 Mark Quilter and his wife Francis lived nearby in a small single-room house. Quilter made his living as a cow-keeper in the common land on the north side of town and seemed to be the object of public insults, which caused Quilter to be overly protective of his authority at home. One March morning in 1664 Rebeckah Tuttle arrived to “sit and work” with Goody Quilter and “to bear her company,” leaving us with an amusing story that has been handed down for generations. 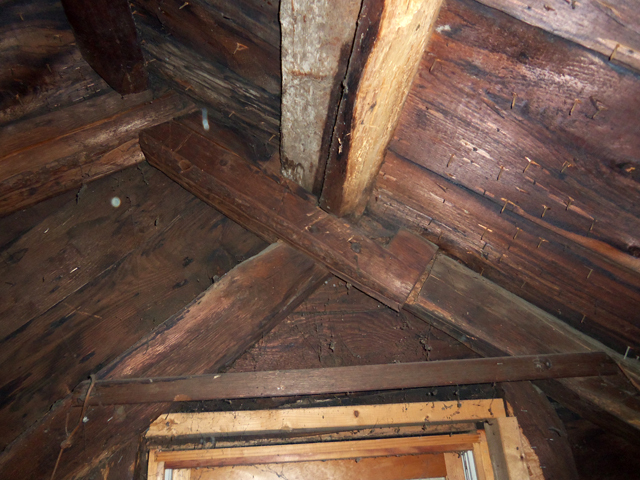 Attic framing shows how the roof was raised when the lean-to was added. The original and “new” rooflines are both visible. Remnants of a stick and mud chimney? 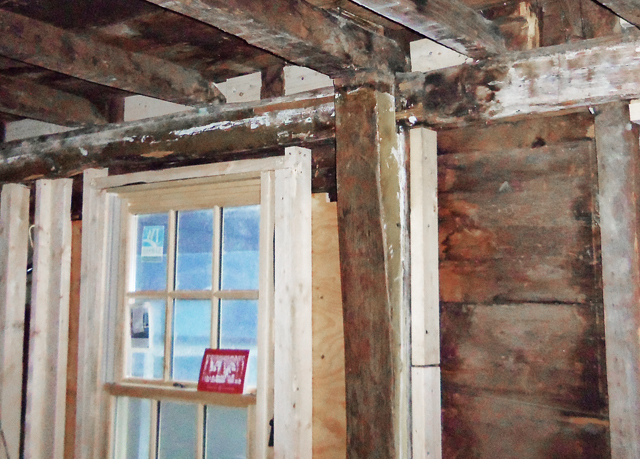 In 2016 the owners of the oldest northwest oldest part of the house gutted the downstairs bathroom and exposed the timber floor frame, which sits just above the soil level, unlike the front of the house. In the inside corner adjoining the main house they discovered what appeared to be a foundation composed of mud, clay, small stones and short sticks that had been cut to a uniform thickness and length. Possible remnants of a much and stick chimney were exposed under the flooring of the Shatswell house. The above photo may show the remnants of a chimney from the early Shatswell cottage. Primitive chimneys constructed in the first few years of Ipswich settlement were often of the “mud and stick” variety. 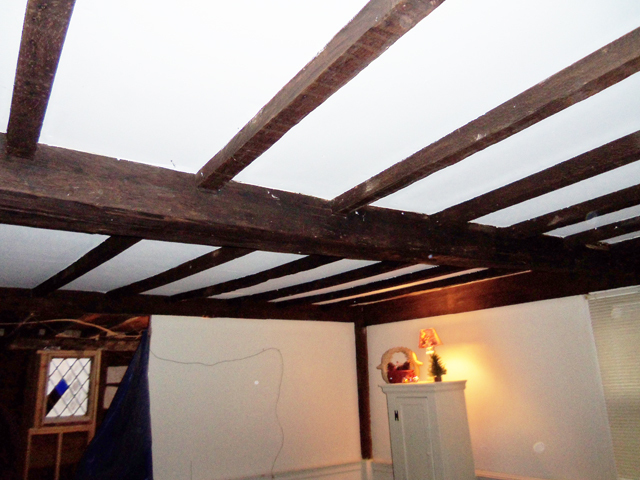 Here, a mud-based plaster or clay was thickly applied to a rude frame sub-structure of overlaid logs or planks. Even when the lower part of the chimney, enclosing the firebox, was constructed of fieldstone, the narrow chimneystack above might be composed of such a mud and stick compound. Impermanent by their very nature, and highly susceptible to fire unless constantly maintained, mud-and-stick chimneys were usually replaced as soon as practicable by more permanent constructions of brick or stone. Hence, few mud-and-stick “Mudcat chimneys” survive today. Clay was thickly applied to a rude frame filled with a mud and stick compound. Clay chimneys were impervious to water but highly susceptible to fire, and were thus replaced as soon as practicable by brick or stone. Very few mud and stick chimneys survive today. The re-creation of the chimney at the Alexander Knight house opposite the Ipswich Museum was constructed in this way. Beside the remnants of the mud and stick, the owners uncovered a heap of animal bones, for which we have no easy explanation. Even more curious was that the excavated area in the lower left corner of the photo above contained at heap of animal bones, for which we have no easy explanation. DNA testing may help sort out this mystery. 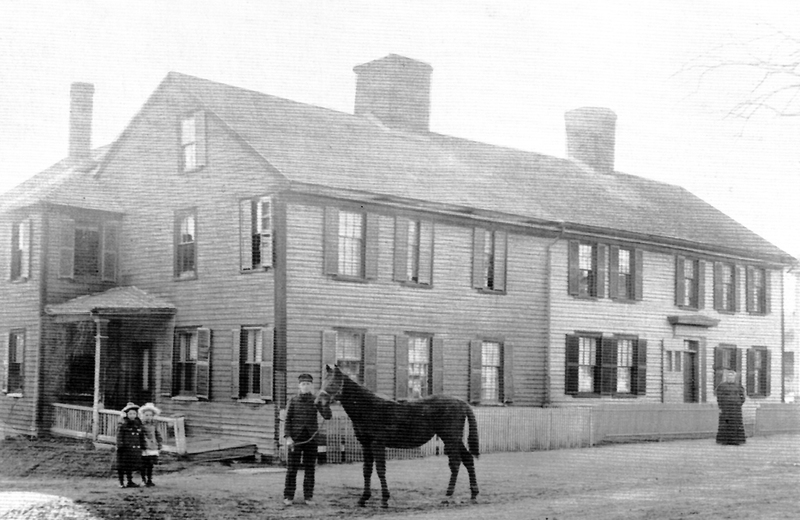 A building that may be the original Shatswell planters cottage was moved from High Street to the Wendell Estate on Jeffreys Neck Road from the Shatswell property in the early 1940’s along with the Lord-Collins house from South Main St. Dated before 1646, the Shatswell Planters Cottage is said to to be the oldest structure in Ipswich. Recent excavations at the Shatswell house at 90 High St. may have revealed the remnants of a stick and mud chimney from the early building. The Shatswell Planters Cottage is shown in this closeup from the 1893 Birdseye Map of Ipswich. 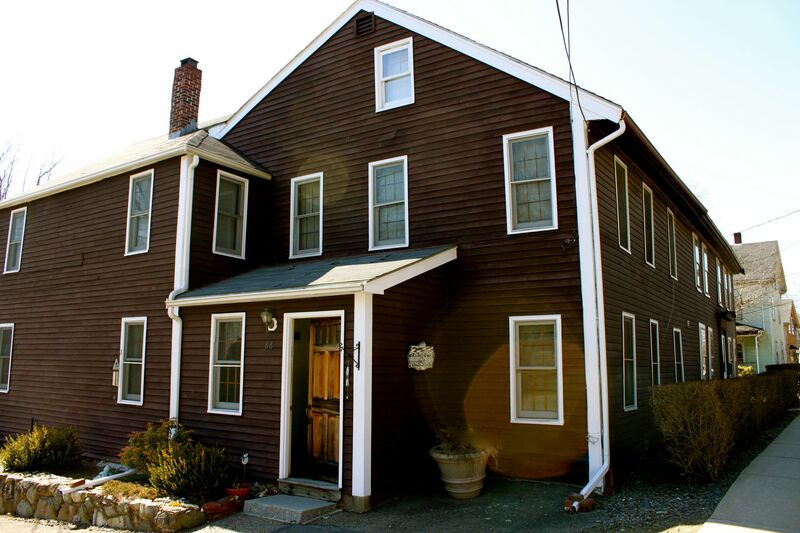 Nathaniel Shatswell was born on Nov. 26, 1834 and grew up in the historic Shatswell home on High St. During the Civil War, he was instrumental in forming the Ipswich companies, and rose to the rank of colonel. In the spring of 1861, Company A and L of the First Massachusetts Heavy Artillery Regiment were assembled with Ipswich soldiers, and were assigned to protect the forts around Washington, D.C. When the Confederates attacked at Harris Farm during the part of the Battle of Spotsylvania Courthouse, the First Regiment went into battle. Rebel bullets began to fly, and before long many Union soldiers were dead or injured. Colonel Shatswell was glazed by a bullet to his head early in the battle, but returned to take command. With blood saturating his coat, Shatswell inspired his fellow soldiers. Although 398 men from the First Regiment were killed early in the battle, Shatswell’s troops drove the Confederates into the cover of the woods. Every time they emerged, the first battalion charged and drove them back, eventually ending with a Northern victory. The Harris Farm battle claimed 1,598 Confederate and Union lives. After the war, Col. Shatwell worked for a while as the assistant superintendent of the Ipswich House of Correction, but in 1890 Shatwell became the curator of the museum of the Department of Agriculture in Washington D.C. Nathaniel Shatwell died on December 14, 1905, and is buried in the Old North Burial Ground, alongside his wife, Mary White. 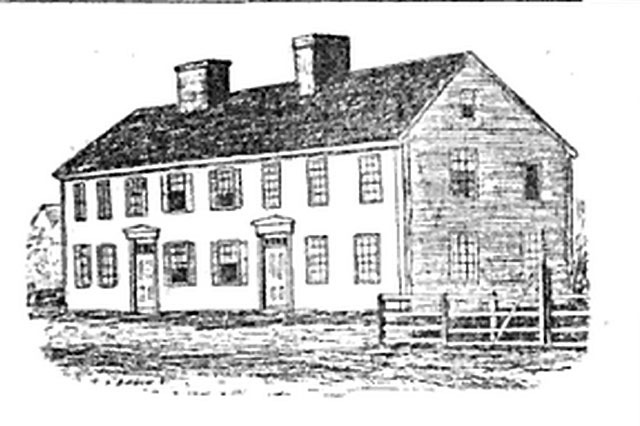 Nathaniel Shatswell owned this cottage that was dubbed “The Grand Army House” on Little Neck. 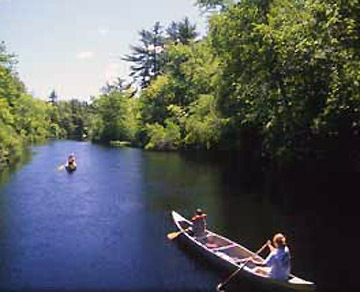 In 1875, General William Sutton hosted 67 Ipswich men, all over the age of 70, to an outing at General Shatswell’s cottage. Alice Keenan wrote extensively about the event in her book, Ipswich Yesterday. 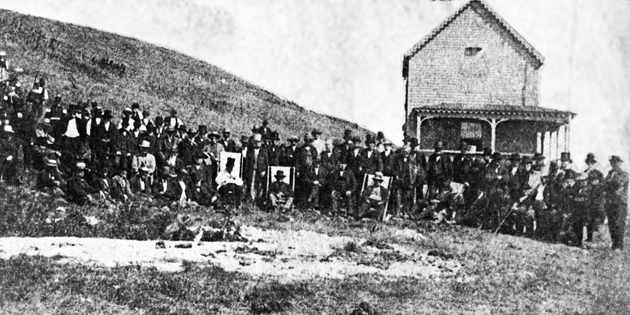 A young reporter wrote about the event, “These old men who had seen generations born and die, who lived to talk with the men who had formed our nation, were not idle.” After a hearty dinner and a climb to the top of the hill, they gathered in groups and discussed the deplorable degeneracy of the times.